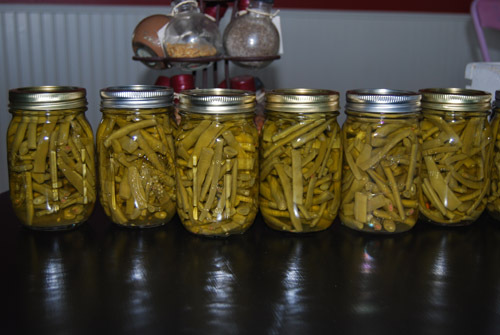 My kids refuse to eat canned green beans from the store, and I can’t say I blame them. Home bottled beans are a staple at our house, especially for the little ones. Beans from the garden were one of the first foods I fed my babies. I only plant pole beans once every two years; this was a year for beans. I wasn’t even watching them to see if they should be picked because in years past they haven’t been ready until closer to September. 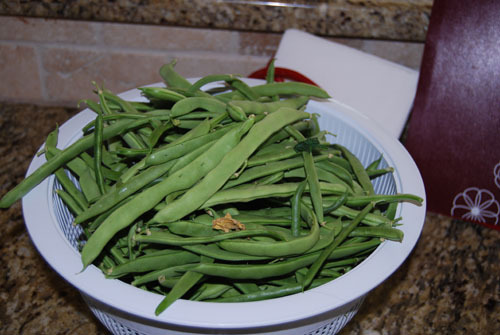 However, as I was pulling weeds on Wednesday getting ready for a garden party in the yard I noticed I had tons of great big beans. Canning season is officially open! 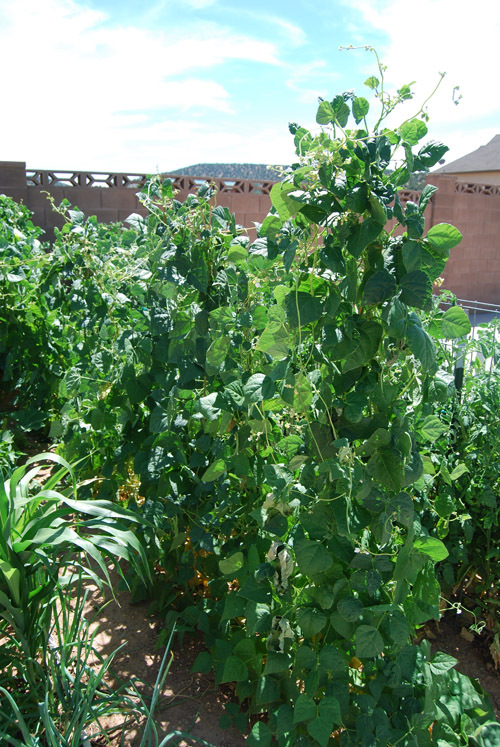 This is my 19 ft row of pole beans. They are obviously growing well (over 6ft tall!!). I should have thinned them a bit more so they would be easier to pick but at the same time I like how bushy they are. One of the support poles broke, making the row tip sideways in the middle. One day when Logan is home I will have him help me install a new middle support post. I don’t know what it is about beans but I love the plants (I’d like to say I love the vegetable too but it’s really just a vegetable). 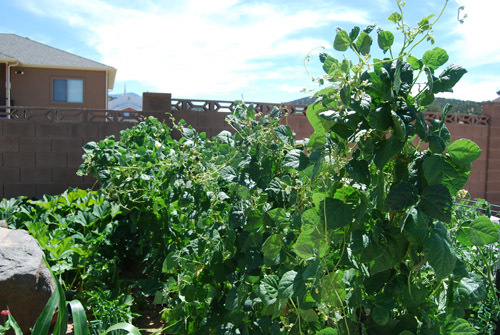 Sometimes I’m tempted to plant beans just for the vine. Maybe next year I’ll plant some in the chicken coop and let the chickens eat the beans. Back to canning green beans: Luckily beans are easy, I say ‘luckily’ because they have to be done regularly (2-3 times per week from the middle of August thru the end of September). Step 1: Pick the beans. You want pods that are good in size but aren’t so big they are bulging or losing their color. 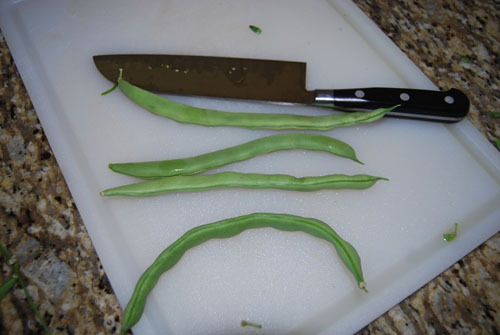 Depending on the type of bean, they should be ready to pick when they are about 4-6 inches long. I picked a few that were far beyond the appropriate picking size (they went to the chickens). 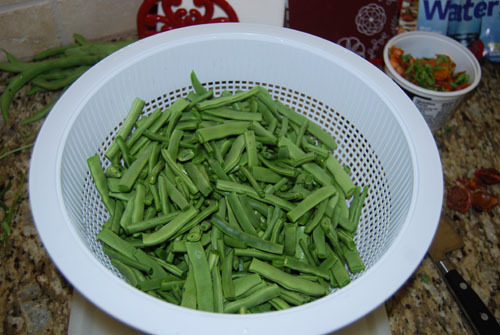 Step 2: Wash the beans and remove pods that are too big. Step 3: Snap and trim the beans. Both ends should be removed and the beans should be snapped into 2″ pieces. In years past I have always snapped the pods with my fingers, removing the ends with my finger nail, I have since decided I prefer to use a knife. The result is the same. 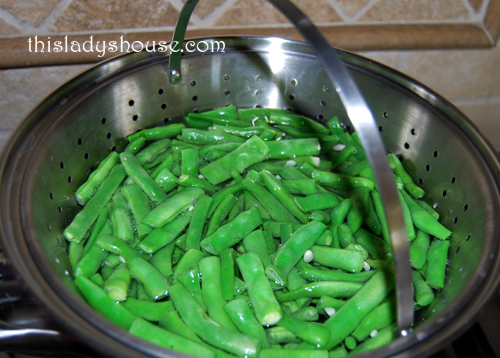 Step 4: Place snapped beans into a pot of boiling water; allow to cook for 5 minutes. Drain the beans and place them in ice water to cool. Step 5: Pack beans into jars. This requires a bit of pounding the jar on a towel, you want the beans packed in fairly tight! Step 6: Add Salt. I typically put 1/2 tsp of salt in each pint jar and 1 tsp salt in each quart jar. Salt is 100% optional! I choose to use it because it makes the flavor a bit stronger, which I perfer. Step 7: Pour boiling water into the jar of beans leaving a 1/4 inch head space at the top. Push a small plastic spoon handle along the inside edges of the bottle to remove air bubbles. This may also give some room to add more beans. Step 8: Clean and Secure Lids. 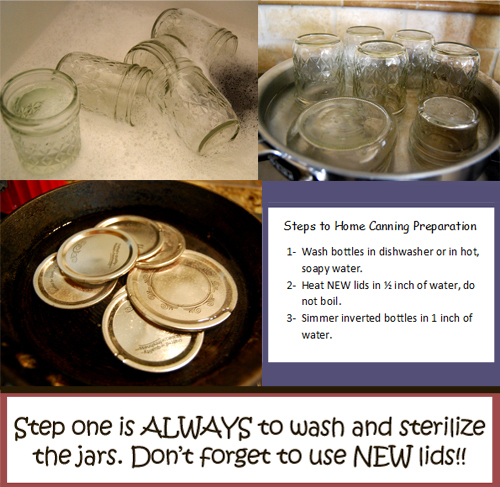 Wipe the rims of each bottle to remove any salt residue, then secure the lids and rings. Step 8: Pressure. Put bottles in a pressure canner and cover with water (be sure you understand how a pressure cooker works before doing this for the first time or you could easily ruin your beans! As a kid I remember my dad playing with the pressure valve and releasing pressure before the water had cooled, this causes the water to escape out of the bottles and makes my mother very angry!) The elevation in Cedar City is almost 6000ft so I pressure my beans at 13lbs for 20 minutes. To see a chart for pressuring beans at your altitude see PIckyourown.org.